While the fishing has been quite good as we officially enter the beginning of summer, the weather has been anything but. Another tropical system is currently engulfing the state bring more clouds and rain, the enemy of the sight fisherman. It seems like the past month has brought a higher than average amount of wind and clouds to central Florida. Hopefully, we will return to a more normal pattern soon. When the weather has cooperated, the fishing has been quite good. The water level in the Lagoon system is nearly one foot higher than it usually is this time of year. This gives the fish more places to roam and you are likely to find them in some unusual and unexpected places. Fortunately, we have not experienced the heavy algae bloom that invaded our waters last year. Most of the flats are clear. When the sun is out, sight fishing is excellent. On one of the nicer weather days, Jay and Marc joined me for an outstanding day on the flats. Numerous redfish and trout were landed on a variety of baits and flies including DOA Baitbusters and CALs and some of Jay’s secret baitfish pattern flies. Last week, I made my annual trip to the DOA Outdoor Writers Event in Stuart. 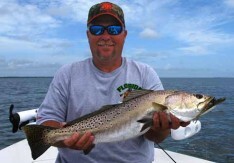 On the first day, I fished with Homosassa Guide and writer Capt. William Toney. We used the Holographic 1/4 ounce shrimp to catch a variety of trout, flounder, snapper, lookdowns, jacks, and snook. The following day I fished with Cheryl and Polly. We stayed around the St. Lucie Inlet hoping for a giant snook. We found some huge fish hugging the bottom and tied on some 1/4 jigheads with a 3 inch holographic paddle tail CAL. Ceryl hooked up first but the huge fish cut through the 30lb leader. 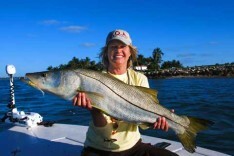 A few minutes later, Polly stuck a 37 inch snook and landed it using 10 pound braid. It was her largest snook to date. 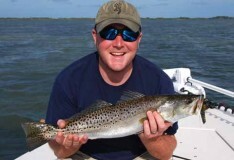 Back in Mosquito Lagoon, I teamed up with Capt. Drew Cavanaugh for a day of scouting and fun fishing. We found some hungry redfish and had a blast watching them crush the Baitbuster on the surface. 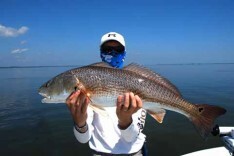 Check out my Youtube page for a short video of a topwater redfish bite. I also hooked several large fish using the BFL 5.5 lure. On my charter the following day, the conditions were not quite as good and sight fishing was difficult. 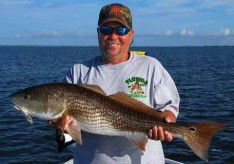 George managed to land several nice trout and a half dozen redfish casting a 5.5 inch CAL with a Woodies Rattle in areas where the fish were holding. Despite a forecast of clouds and high winds, David elected to keep his charter date for Thursday. It turned out to be an excellent decision. The morning started out clear and calm. We started off looking for tarpon. There were none to be found. 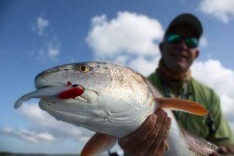 The redfish, however, were happy to play. David landed three reds over 34 inches on the Baitbuster before the clouds moved in and we lost our visibility.The rest of the morning was spent blind casting which produced several more redfish and a nice trout. 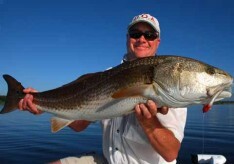 When this current system passes through, look for the steady redfish and trout action to continue. With the high water, many of the flats are too deep to see tailing fish. The high water is allowing fish to get close to the shore and into the back bays and coves which are usually too shallow for both boats and fish during the summer. 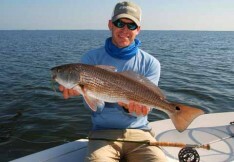 Finding the redfish can take some time and effort on some days. The easiest fishing can be had on the deeper edges of the flats around mullet schools. Topwater baits, as well as jigs with soft plastics can produce some fast action for trout and ladyfish. Pinching off the barbs will make it easier on the fish and the person doing the dehooking. Fly anglers can use weighted flies such as a clouser minnow pattern in the same areas.